New research presented at the 47th Annual Meeting of the Division of Planetary Sciences reveals that the long, shallow grooves lining the surface of Phobos are likely early signs of the structural failure that will ultimately destroy this moon of Mars. Orbiting a mere 3,700 miles (6,000 kilometers) above the surface of Mars, Phobos is closer to its planet than any other moon in the solar system. Mars’ gravity is drawing in Phobos, the larger of its two moons, by about 6.6 feet (2 meters) every hundred years. Scientists expect the moon to be pulled apart in 30 to 50 million years. The findings by Hurford and his colleagues are being presented November 10, 2015, at the annual Meeting of the Division of Planetary Sciences of the American Astronomical Society at National Harbor, Maryland. Phobos’ grooves were long thought to be fractures caused by the impact that formed Stickney crater. That collision was so powerful, it came close to shattering Phobos. However, scientists eventually determined that the grooves don’t radiate outward from the crater itself but from a focal point nearby. An interior like this can distort easily because it has very little strength and forces the outer layer to readjust. The researchers think the outer layer of Phobos behaves elastically and builds stress, but it’s weak enough that these stresses can cause it to fail. All of this means the tidal forces acting on Phobos can produce more than enough stress to fracture the surface. Stress fractures predicted by this model line up very well with the grooves seen in images of Phobos. This explanation also fits with the observation that some grooves are younger than others, which would be the case if the process that creates them is ongoing. “We can’t image those distant planets to see what’s going on, but this work can help us understand those systems, because any kind of planet falling into its host star could get torn apart in the same way,” said Hurford. 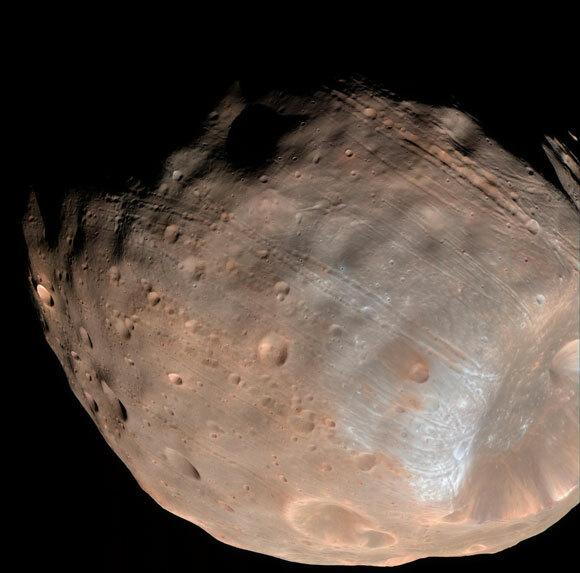 3 Comments on "Mars’ Moon Phobos Shows Signs of Structural Failure"
This conclusion assumes the large crater was caused by a single large object. That object however could have been a large object accompanied by hundreds of others, in other words, that object was itself in the process of breaking up when it hit Phobos. I think the streaks were caused by these hundreds of smaller objects striking Phobos at a glancing angle. Also, Phobos may have been more spherical then, than the egg shape it is now. There are several deep impacts that occurred after the lines were created that indicate that the line features are local to the surface, and do not travel into the sub-structure. This would give credence to the theory that these were projectiles from the massive collision that bounced along the surface. It is plausible to believe that any satellite falling on the planet by its gravity should be torn apart. Even in the case of meteors which are also solids in a miniature way, we find the asteroids being torn to pieces as it enters gravity. A big solid will not go to pieces but crack itself to one or two pieces intact. Thank You.